PN’s relationship with Nixon and Nixon Pacific began in March 2008 at the Global Shop trade show. The Nixon representative was initially drawn to the PN booth because it had a clean, straightforward aesthetic. Impressed by customer service, cost-effectiveness, and in-house manufacturing control, Nixon decided to forge a partnership with PN. PN functions primarily as a manufacturer for Nixon, engineering the vision of their design into reality. We have been producing in-case elements and fixtures for Nixon for the past six years, initially sharing the business with another company before our service and pricing prompted Nixon to award PN all business in the United States, Canada, and the Pacific Islands. The most significant project Pacific Northern has done for Nixon is their basic fixture and display systems, which is an ongoing order. 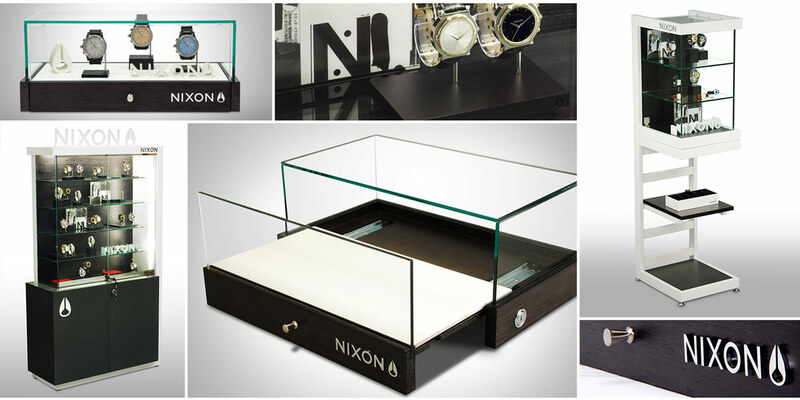 Products in the Nixon display program include injection-molded in-case displays, fabric-wrapped displays and a variety of free-standing display fixtures.